Oxidation can be defined in several different ways. The simplest and most rigorous of these is "the loss of electrons from an atom, compound or molecule." In general use, the term is generally applied to a chemical reaction of a substance with oxygen (O2) or an oxygen-containing material which adds oxygen atom(s) to the compound being oxidized. Either way, you can not create energy from nothing. Whenever something is oxidized, something else must undergo the opposite (loss of electrons), reduction. A species that causes oxidation is called an oxidant, oxidizer, or oxidizing agent. A species that causes reduction is called a reductant or reducing agent. Get your D.O.T. HazMat labels, signs and placards at Safety Emporium. Oxidation and reduction are easier to explain using oxidation states (also called oxidation numbers). Oxidation states are assigned to atoms in a molecule or compound using a general set of rules. Take a look at this tutorial to see the rules and test yourself. In this reaction, oxygen oxidizes hydrogen from H2 in the zero oxidation state to H+ in the +1 oxidation state. Oxygen, in turn, must be reduced from the zero oxidation state to O2- in the -2 oxidation state. This particular reaction also produces a large amount of heat energy (exothermic, can you say Hindenberg?). By definition, during an oxidation-reduction reaction the oxidizer (oxidant) is always reduced and the reducing agent (reductant) is always oxidized. Fe2O3 (solid) + 2 Al (solid) ---> 2 Fe (liquid) + 2 Al2O3 (solid) + lots of heat! This reaction generates so much heat that the iron metal product is molten. In fact, this reaction can be used to weld pipes underwater! This series of terms usually appears on an MSDS to warn of very high chemical reactivity and/or the potential for a serious accident if the material comes into contact with incompatibles. It may also be used in the context of a spill cleanup procedure. Oxidation reactions are usually very exothermic. 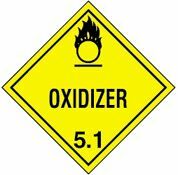 Therefore, if a compound says "OXIDIZER", this means that it can cause other materials to combust more readily (or upon contact!) or make fires burn more fiercely. Always store oxidizers away from flammable or combustible materials as well as sources of heat, flame or sparks. Be sure to examine the MSDS and label carefully to determine which materials are incompatible. The thermite reaction in terrific detail and a QuickTime video. Brought to you by...us! Reduction and Oxidation Reactions at Chemtutor. A good resource for chemistry students. Oxidation-Reduction Reactions at Purdue University. Also a good chemistry student resource. See also: air, exothermic, incompatible. Handle flammable materials correctly with training materials and equipment from Safety Emporium.